Art on the Rail Trail is one of the community art projects that was funded by this program this year. Community Arts Grants are available in Albany, Rensselaer and Schenectady Counties through a competitive re-grant program administered by The Arts Center of the Capital Region (ACCR). Funds are provided on a statewide basis through the New York State Council on the Arts (NYSCA) Decentralization (DEC) Program to develop high quality arts projects and programming including performing, literary, media, and visual arts and to contribute to region's communities by providing opportunities for the public to experience and engage with the arts. Emphasis is placed on the quality and artistic merit of proposed projects and the depth and authenticity of audience experience, participation and engagement. Here's the list of local projects who got money for this year. Be sure to check out the guidelines for applying. This online presentation is a quick trip through the info. The meeting at the Arts Center in downtown Troy is Wednesday, November 7 at 6 pm. The intent-to-apply deadline for the grants is November 18, and the final application deadline is December 2. Took a minute the other day to admire this little mural in the Williams Street alley just off Broadway in downtown Troy. It's just very pleasant. 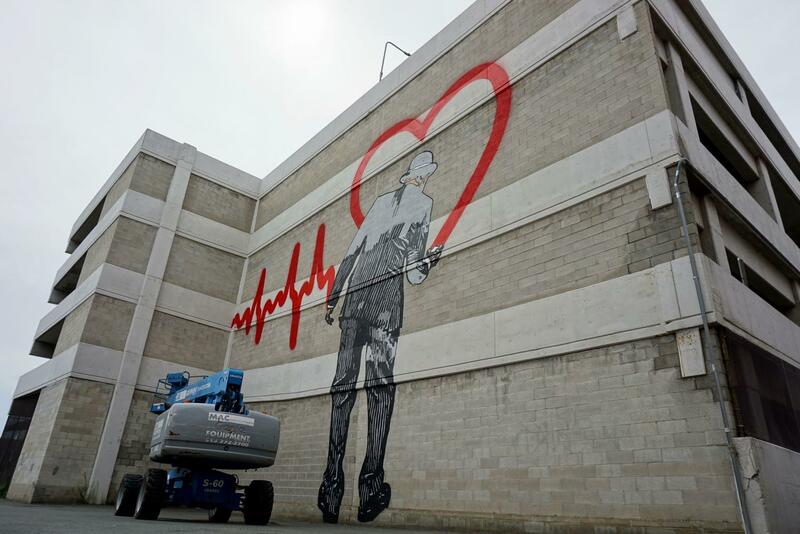 Walker's mural, titled "Love Goes On," represents the universal message of love having the capability to be the everlasting entity in a world of fleeting things and moments. His mural is asking us to be thankful for love and to allow it to last. The red, white, black and gray mural will be 40 feet by 60 feet. Walker is an internationally-famous artist, with street art that's appeared in the UK, Paris, New York City, Los Angeles, and other cities around the world. That figure in the new mural here in Albany is his trademark character "The Vandal." We got a chance to check out the mural on the Helderberg Hudson Rail Trail last week. It's on the support pillars that hold up the Cherry Ave overpass across the trail. There are a few more photos below that have a wider look at the mural. The artwork -- "Full Spectrum" -- is the creation of John DeMarco, and it's part of an ongoing effort by the Mohawk Hudson Land Conservancy's aptly-named Art on the Rail Trail (ART) group to add public art to the popular trail. ART also is working toward a third mural, on the inside of the top of the bridge that crosses Delaware Ave in Delmar. The call for submissions closed in August. So keep an eye out for updates. Art on the Rail Trail is organizing a chalk art contest on the rail trail Saturday, September 22 at Hudson Ave and Adams Street in Delmar from 11 am to 3 pm.. It's $10 to enter ahead / $15 day of. We got a chance to stop in downtown Albany Thursday and see local artist Liz Zunon putting the final touches on her new mural along the wall for the Clinton Ave off ramp near the Quackenbush Garage. Zunon is an accomplished children's book illustrator. And we got a chance to talk with her for a few minutes Thursday about what it was like to create something on a much larger scale. Also: A handful of photos of the new mural. John describes the work as "making flowers and grasses larger than life, to capture the rail trailer's attention and imagination. Some of the references for the flora come from photos taken along the rail trail, walks in my neighborhood, and my mother-in-law's garden." The murals will cover each of the eight pillars under the bridge. 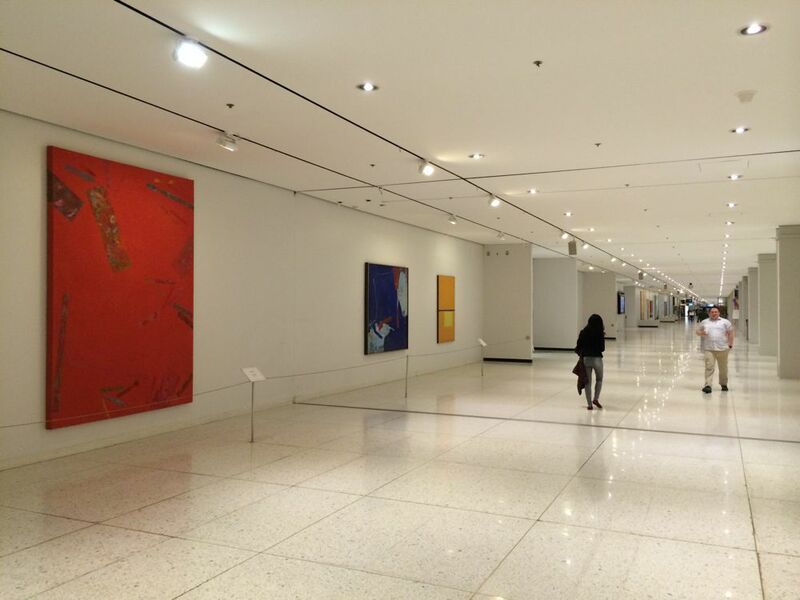 Every pillar will be painted in a different, brilliant hue, with silhouettes of organic forms imposed over the color. There's a community paint day for the mural this Friday, August 17 from 9 am to noon if you'd like to pitch in. 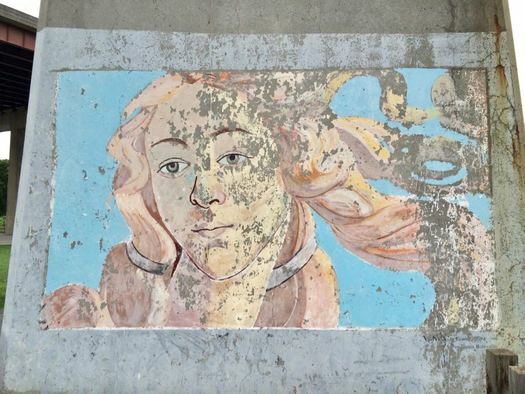 With mural #2 in progress, the Art on the Rail Trail committee of the Mohawk Hudson Land Conservancy is already pursuing a third mural -- this time on the inside of the top of the bridge that crosses Delaware Ave in Delmar (site photo). And there's an open call for artists who would be interested in creating the mural. See that link for details. The deadline to apply is August 24. The project has a budget of $2000-$3000, which would include the artist fee and supplies. Check it out: The next downtown Albany mural is being created by local artist Liz Zunon, and she'll be working on it during the next two weeks. The mural is along south side wall of the Clinton Ave off-ramp at Broadway, near the Quackenbush Parking Garage. Look for the bluebird mural on the garage and the new mural-in-progress is nearby on ground level. The public artwork is part of an ongoing collaboration between the Albany Parking Authority, Albany Center Gallery, and Albany Barn. The orgs have already teamed up for a handful of other murals downtown (see the links below). You might be familiar with Liz Zunon's work. She's an accomplished children's book illustrator. (She's also working on a book she both authored and illustrated, Grandpa Cacao, that's inspired by her time growing up in Ivory Coast. It's set to be published next year.) And Zunon also created one of those giant Dutch clogs that were placed around Albany a few years back as part of a public art installation. There's a walking tour of downtown Albany's murals June 27. And it's free, though the organizers do ask that your RSVP. The event will begin at the Albany Center Gallery at 5:45PM. After a brief description of the #CapitalWalls program led by curator Tony Iadicicco, we will embark on a walking tour with the mural artists who will share their artwork, process, and perspective. The tour will end at the English Pub's outdoor patio, where we'll continue discussions inspired by the murals. 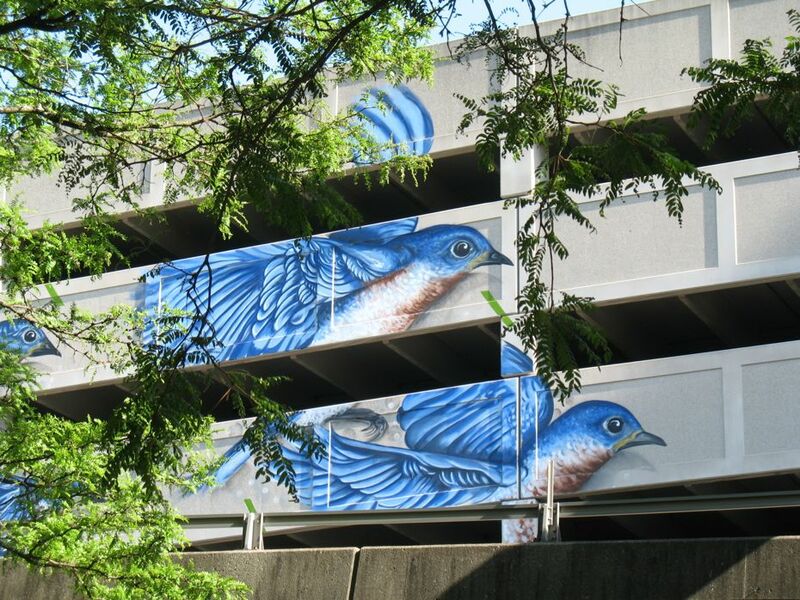 + The bluebirds on the side of the Quackenbush Parking Garage by Michael Conlin (above). + The colorful pattern mural on the other side of the Quackenbush by Hellbent. 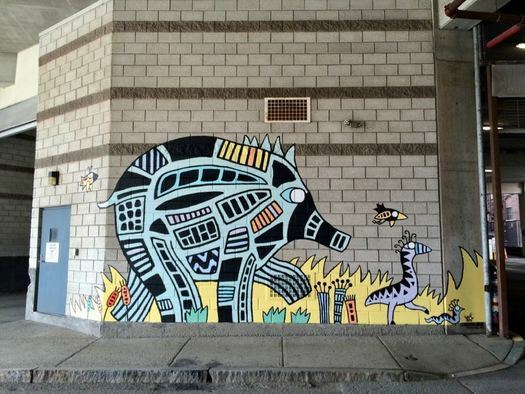 + Murals by Sylvie Kantorovitz and Cara Hanley on the Green-Hudson Parking Garage. + And the map-inspired mural by Rachel Baxter on a 787 support wall along Water Street. The walking tour is Wednesday, June 27 starting at 5:45 pm. The mural by Andrea Hersh at Adams Street and Hudson Ave in Delmar. 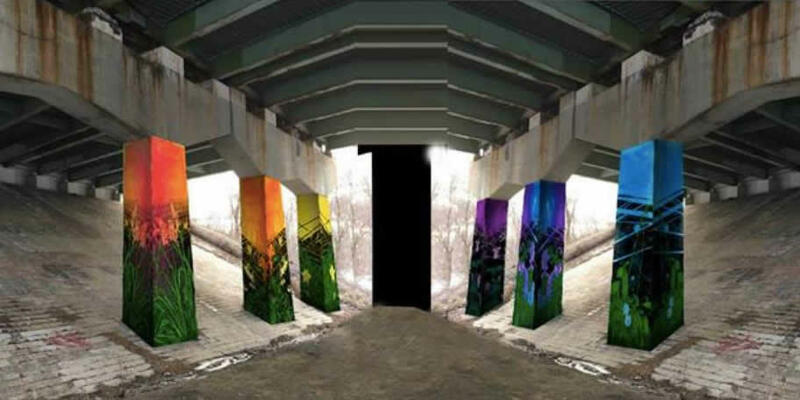 Art on the Rail Trail (ART), a new initiative designed to bring public art installations to the Albany County Helderberg-Hudson Rail Trail, is excited to announce a call for artists interested in developing an original public artwork for the piers along the Rail Trail, under the Cherry Avenue Extension bridge. We welcome all artists to apply, but specifically encourage those who work in public art, murals, and mosaic. Artists, designers, studios, and teams may submit multiple concepts for this project, and artists from any location are encouraged to apply. However, preference will be given to Capital Region artists and those from the surrounding area (defined by artists living within a 100-mile radius from the Town of Bethlehem). The project fee is $5,000 -- that's to cover the artist fee, supplies, equipment, and other expenses. The submission deadline is June 17. Here's the location of Cherry Ave Ext bridge. That first link above includes important application info. The first ART project -- a mural by Andrea Hersh on a trail-adjacent building on Adams Street in Delmar -- debuted last October. 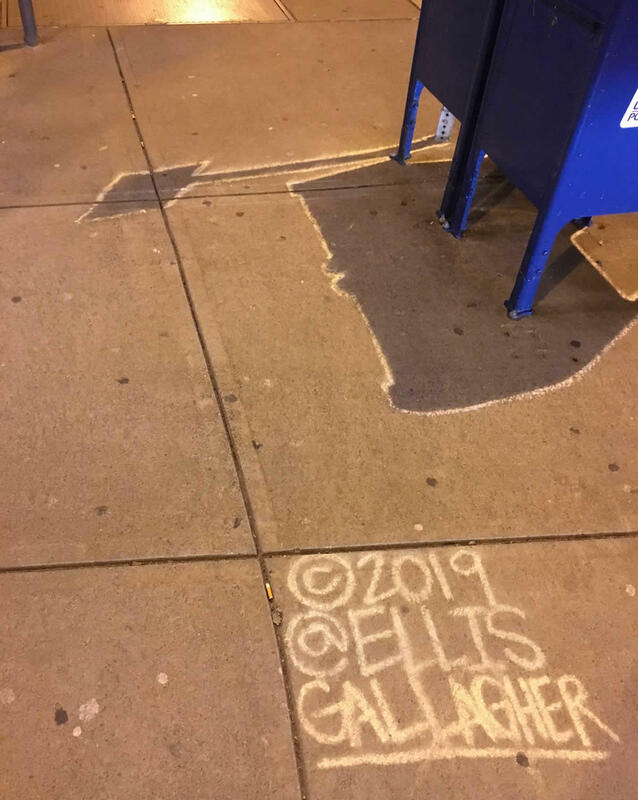 If you head over to Gallagher's Instagram, you can see a few more works: next to the Capitol, and at Lark and Spring. Here's a NYT profile of Gallagher from way back in 2005 that looks at the origin of the chalk shadow work. If you noticed any others and snapped a pic, we'd love to see them. 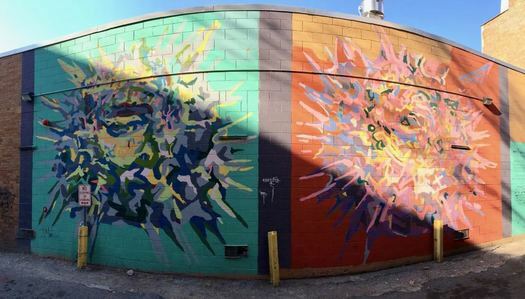 Just a quick heads up that the mural project that Upstate Artists Guild and the Pine Hills Improvement Group are collaborating on at the Maple Leaf Market building at Ontario and Morris streets in Albany is still looking for an artist. The application deadline has been extended to February 10. Some themes for this mural might include community, neighborhood, maple leaves/trees, streetscape, historic city, food, among other options. You are encouraged to make this mural fun, playful, and funky. While you are welcome to complete the entire mural on your own, you are also encouraged to consider developing an outline and a color scheme that neighbors can then help paint in (think coloring sheet). The organizers will cover the cost of the supplies, and the artist will also get a stipend. See that link above for details about applying. There's was something about the way the late-autumn light was slicing down the alleys of Troy. 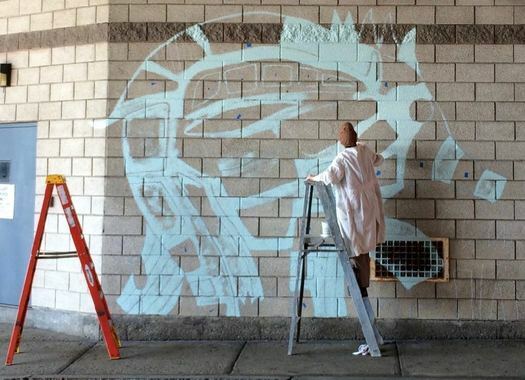 Here's a beginning-middle-end gif of a portion of Sylvie Kantorovitz's new mural in the Green-Hudson parking garage. It's one of three new murals downtown that are part of the Capital Walls project. Here's some photo follow-up on those three murals-in-progress in downtown Albany was posted about last week. As Iadicicco told us last week, "The goal is to inspire and create community and sense of place." There's also some artwork on the 10 feet-by-40 feet wall. Whether it's replaced or incorporated into the new design is up to the artist. The cost of materials for the work will be covered, and the artist will also get a stipend. Here are more details about applying. The Pine Hills Improvement Group is committee of the Pine Hills Neighborhood Association. Something you might notice this week: Three new murals are going up in downtown Albany. Two of the murals are in the Green Street drive-through section of the Green-Hudson parking garage, and the other is on the side of a wall along Water Street and I-787 by the Riverfront parking garage. 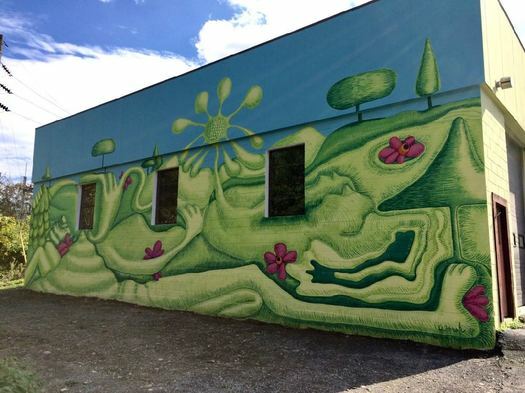 "The goal is to inspire and create community and sense of place," said Iadicicco of the murals. 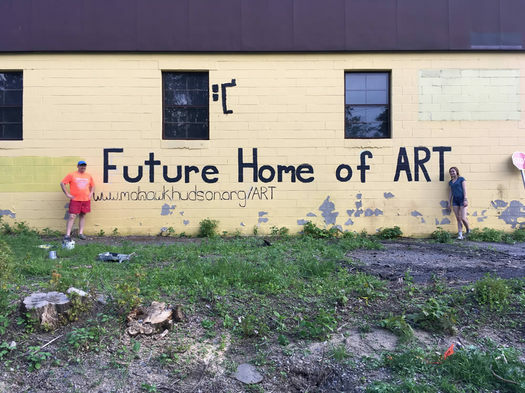 Another quick update on the Helderberg-Hudson Rail Trail mural project in Delmar: The Mohawk Hudson Land Conservancy's Art on the Rail Trail committee selected artist Andrea Hersh to create the mural, and she finished the work this past weekend. The mural is on the side of a garage building along the trail at Adams Street and Hudson Ave. If you walk or bike that section of the path in Delmar you can't miss it. This mural represents a lush and pristine world of imagined creatures, with rolling hills that are part humanoid trees and vegetation. I continually strive to bring balance into my art. I am a person who always sees two sides to every story, balancing family and work, society and solitude, whimsy and cold reality. There are always two sided to every story and although we see the beauty in this image there is the underlying reality of our disposable world. There will be a formal unveiling of the mural Saturday, October 28 at 11 am. Hersh will be there and there will be refreshments. By the way: If you haven't walked or biked the rail trail yet, try to make some time over the next few weeks. The path through the Normanskill gorge up into Bethlehem should be beautiful as the leaves change. 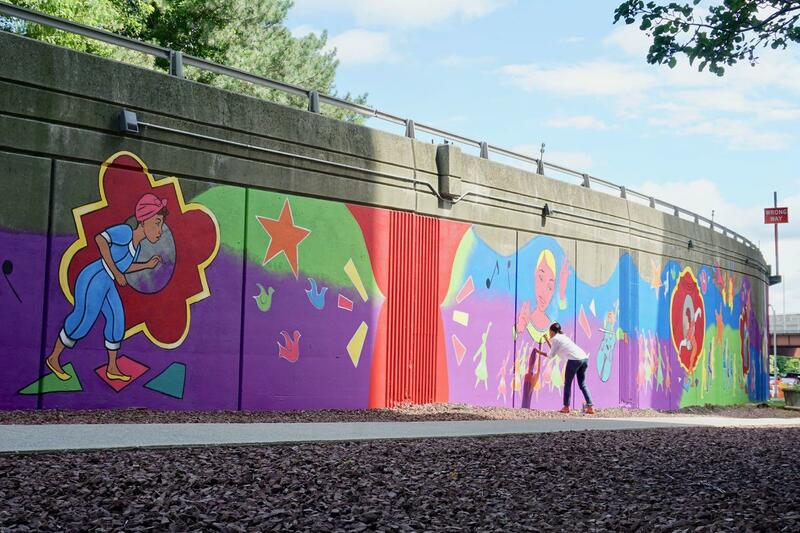 Quick update on that Helderberg-Hudson Rail Trail mural project: The three artists selected as finalists will be at a public meeting at Bethlehem Town Hall September 7 from 5:30-7:30 pm. Press release blurbage: "The artists will be on hand at the community meeting, to discuss their proposals and address any questions from attendees. Each artist will bring their drawings and community members are invited to view each proposal and submit opinions to the committee." The mural site is a building at the corner of Adams Street and Hudson Ave in Delmar. If you've walked or biked along that section of the trail, you can't miss it. 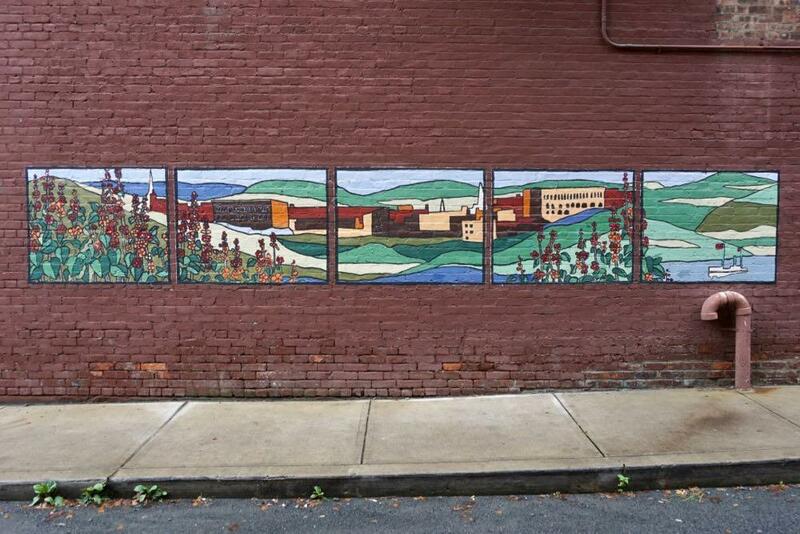 The land conservancy is hoping to have the mural completed by late October. During its 3 week run, we will coordinate programming with local cultural partners, host fun events and showcase "Explore Troy Projects," temporary projects created by local artists. We will be asking all who interact with us, both in person and digitally, "What Are Your Ideas for art in Troy?" Information gathered will be presented in a Master Plan for Public Art and the ideas generated will be exhibited at the Arts Center for all to see. The Square will be followed up this fall by "Pop-up" Squares, one night of similar programming in other Troy neighborhoods. The first event is this Wednesday, July 19 from 6-8 pm. 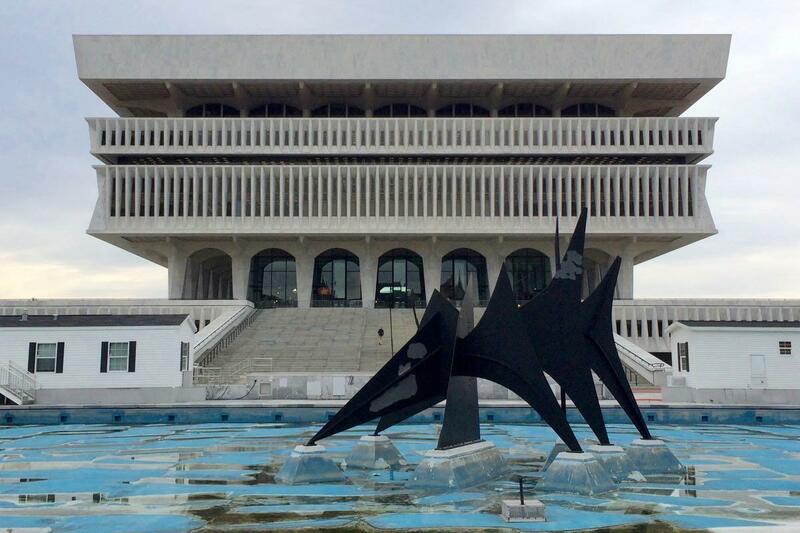 The winning project proposals for 14 public art projects around the city will be announced, city historian Kathy Sheehan will lead a walking tour of downtown monuments, and Geraldine Fuhrmann will tell stories about Troy's history. On Friday, July 28 during Troy Night Out, there will be a reveal of 10 public art ideas for Troy, with discussion from public art experts Judie Gilmore, who's leading the Summer Square series and was the project director for Breathing Lights, and Todd Bressi, who's worked with Mural Arts Philadelphia. That link above has the full list of events, which are all in the evenings. One of the things you notice when seeing the Nippers out and about is the way each artist designed the eyes gives the dogs a different expression. We got a chance during the past week to check out the new "Downtown is Pawsome" statues in downtown Albany as they sit in their new sidewalk habitats. 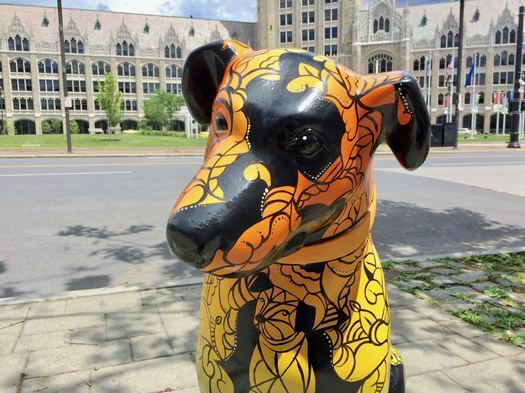 The three-foot-tall statues -- inspired by Nipper and decorated by local artists -- are part of the annual public art program coordinated by the Downtown Albany BID. Eight are already in place, two more will be out this week, and another ten are on their way. Here's a quick photo gawk at the statues, along with a clickable map that we'll update as the statues appear. The pieces are all within walking distance of each other, so you could definitely string them together as part of your own walking tour some day this summer -- with, you know, maybe a stop for a drink or donut along the way. 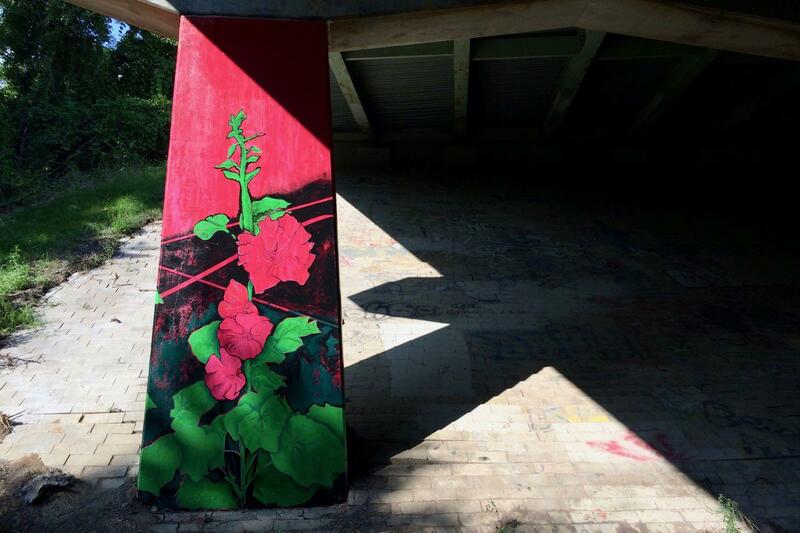 A group connected to the Mohawk Hudson Land Conservancy called Art on the Rail Trail (ART) has been working to set up public art projects along the Helderberg-Hudson Rail Trail. And it's now ready to move forward on its first project, with a call out for artists. Throughout the month of August, up to three finalists will be selected and a public presentation will be made. The committee is prioritizing transparency in the selection process, welcoming community members to voice opinions on the different proposals. By mid-October, the mural will be completed, and there will be a mural unveiling ceremony. Here are the instructions for submitting an application. The deadline July 31 at 11:59 pm. The online materials don't specifically mention the budget that ART has in mind. But we checked with the the Mohawk Hudson Land Conservancy, and here was the response: "ART's goal is to offer an artist fee, which will include all project management, labor, and material costs, of at least $3,000. The committee is actively fundraising and the budget may change over time. A finalized budget will be announced when finalist decisions are made in mid-August."